An exception to this is identifying the locations of compression web bracing. Compression web bracing is different because, as designers and manufacturers, we are taking responsibility for the design and structural performance of the individual components. We must make certain that each truss is designed and built to support the loads stated on the truss design drawing. Compression web bracing generally takes the form of continuous lateral web bracing. If it is required on a truss, the truss designer will point out the location on the truss design drawing. To avoid this from being overlooked in the field, manufacturers may also indicate the location of the brace directly on the truss by using an SBCA bracing tag. This lateral brace stabilizes the web, decreases its tendency to buckle under compression forces and allows the web to reach its full design capacity. 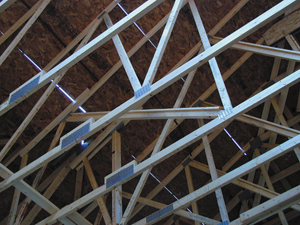 What happens when permanent lateral bracing is not possible to use for the given truss system or individual truss type? The following question deals with alternatives to continuous lateral braces for webs. What is T-bracing? What is it used for? T-bracing takes the place of continuous lateral bracing. Lateral braces need to tie in at least three trusses of the same web configuration (see Figure 1 below). If this is not possible, the web in question must be braced along approximately 90 percent of its length (see Figure 2 below). The bracing material is applied to the web such that in cross section it forms a “T” with the web. Other variations on this type of bracing are L-bracing, U-bracing and scab bracing (see Figure 3 below). The end result of continuous lateral web bracing or T-bracing is to stabilize the web so that it will be able to transfer the compression loads for which it was designed. Check with your engineer for nailing details on how the brace should be attached to the web. For additional information on web bracing, see SBCA’s BCSI-B3 Summary Sheet.